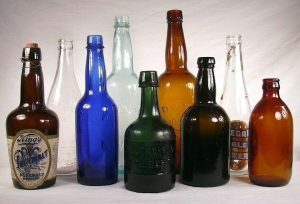 Have you lost count of all the glass bottles in your home? We all know the feeling, buying that one expensive bottle of wine or whiskey or maybe any special drink, eventually finishing it, and then not wanting to get rid of the bottle. Because it was just that expensive! And we all fall victim to collecting that one shape or colour bottle that we hate throwing away, because we could use it for something. Here are some super amazing creative and innovative ideas for your compulsive bottle hoarding! Glass bottle chandelier… wait what? A Chandelier??? YES! A chandelier! This one is only for people with a peculiar taste in home décor. It’s immensely interesting to see what you could come up with. Don’t be afraid to play around with different shades of paint, or colours of canned spray. However, make sure that you choose tones and patterns that match the rest of the desired room, so that your new chandelier complements the rest of the room. Whether it’s for your dining table, or for your kitchen counter, at some point you will need something personalized that makes your house, your home. There are many fun ideas you could play around with! Make sure that when choosing a design, that it complements you as the home owner, and your home. It’s a candle holder and a wind chime! Making these chimes does require a bit of DIY knowledge, so if you don’t regularly craft, then it would probably be insightful for you to do some research beforehand. They are beautiful for an outside porch, or for lighting up your garden. Glass crafting companies like Shades of Ngwenya, reuse and recycle glass and make the most beautifully crafted glass ornaments. If you still have no idea on what you could do with your old glass bottles, and maybe need more inspiration, view Shades of Ngwenya’s showroom!